Mood swings affect not only a woman’s temperament, but also her taste in clothes, shoes and/or bags. One second, she wants to follow the grunge fashion of the 90s, and wear ripped jeans, leather boots, and metal-studded accessories. The next second, everything changes into a more demure style, which consists of a mid-length skirt, a button-down shirt, and shoulder bag. If your mood swings you towards a summer attire, get the promotional tote bag from Tree Hut. Slender Look. It is true that the things you put on your body can affect how you look in other individuals’ eyes. 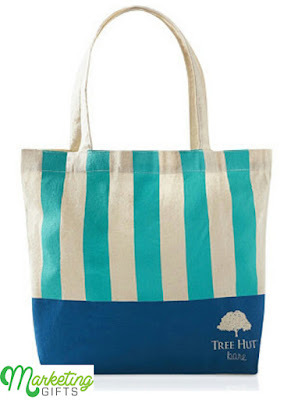 This gift with purchase is designed with vertical stripes, so you may seem slimmer when you use this bag. Large Space. If you are going to a camping retreat or the beach, your towel, clothes and even shoes can be placed in the promo gift. Hence, you won’t need to travel with many stuff. Secured Belongings. The promotional tote bag can be zipped, that’s why your belongings will be safe. This can calm down your nerves, since you cannot always have it wherever you go. In case following the norm has not helped you to advertise your business, perhaps the unique marketing ideas from the Marketing Gifts blog can.